Welcome to KERN's translation office in Mönchengladbach! 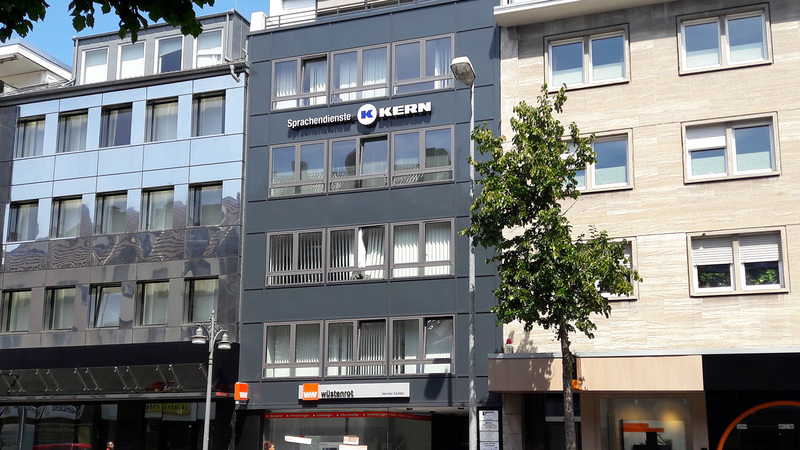 The KERN language services and language training branch in Mönchengladbach opened in 2009. It is one of 56 branches worldwide and is within walking distance of Mönchengladbach's main train station. At the branch, we can offer you certified translations of birth certificates, certificates and other documents in all languages, e.g. Polish, Chinese, Romanian, English, Spanish, and French. Besides certified translations, we also offer technical and specialized translations. Mönchengladbach and the Lower Rhine region as a whole are traditionally home to lots of machine and machine part manufacturers as well as medium-sized chemical manufacturers and logistics companies. KERN supports companies from this region in the translation of technical descriptions, contracts, internal company communication, and marketing texts like websites, catalogs, and flyers. This also includes desktop publishing and layout design, which occur after translation (for example in Japanese, Russian, or Arabic). Get a free quotation here. Alongside one-off translation requests, we assist clients as partners over many years, offering terminology management and interpreting services too. Talk to us about your requirements and arrange an appointment to have an individual consultation. Alongside translating your documents for international use, we can also offer you or your company language and management training. According to your requirements, we can arrange this training at our branch or we can come to you. You can find out more about our language school here and download the KERN vocabulary trainer free of charge. Located in the Lower Rhine region and housing around 270,000 inhabitants, Mönchengladbach is the largest city in the Chamber of Commerce and Industry (CCI) Middle-Lower Rhine district. The name is derived from the River Gladbach and the monks who lived in Gladbach in the 14th century. Today, the people of Gladbach value the numerous shopping facilities in the city center and their internationally renowned soccer team Borussia Mönchengladbach. The most important sights in the city are the 12th century Basilica of St. Vitus on the Abteiberg and the Abteiberg Museum. The city's economy was traditionally shaped by the textile and clothing industry. Today, though, Mönchengladbach is also an attractive location for other industries. Many small, medium, and large companies are attracted to the Lower Rhine region due to its proximity to the Ruhr district, Düsseldorf, Cologne, and the Benelux countries.